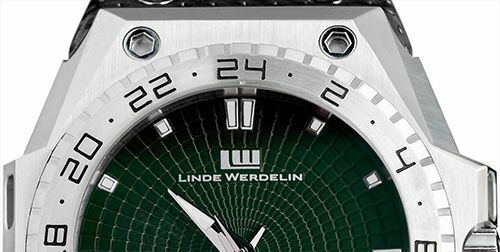 The Linde Werdelin 3-Timer was already available in black, white and brown and now, they introduce a green version of this superb traveller’s time piece. Just like the brown version, it is limited to 22 pieces world wide. The watch has a proven and solid mechanical mechanism (ETA 2893-2) featuring a 2nd time zone hour hand and because of the 24h bezel, you can actually use it to point out a 3rd time zone as well. This 46mm x 49mm x 12mm (w x l x h) watch is not for everyone probably, but let me tell you that it doesn’t wear as big as the specifications let you think, as you can read in my review on the brown 3-Timer here. The green dial 3-Timer comes with a black pointed calf strap and a deployant buckle to keep it put. However, if you are – just like me – not really a fan of deployant buckles, they have a ver nice Ardillion buckle as well. What I really like about this watch, is the dial pattern as shown below in a close-up image. As I wrote before, the dial reminds me of a turtle shell, because the colour and the pattern changes very nicely. This is only the case on the brown (sold out) and this green version though. Further more, the ‘ears’ on this watch that can be used to connect a Reef or Rock instrument makes this watch remind me of a Patek Philippe Nautilus. 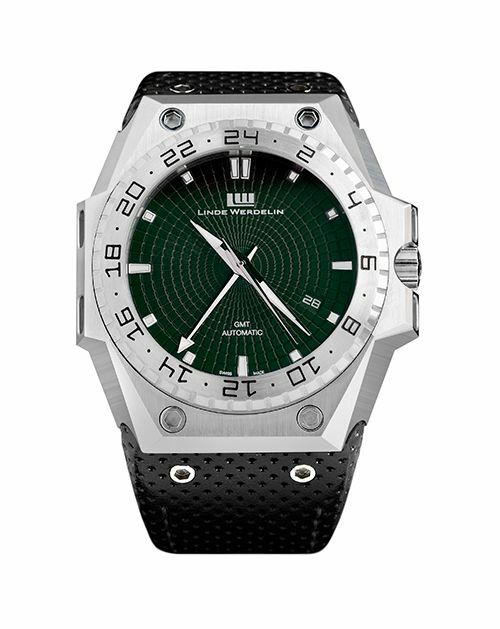 Because of the size of the watch, you could define it as a cross-over “Nautilus Off-Shore”. Perhaps that explains the popularity of this specific model (the guys over Hodinkee can’t stop raving about this watch as well). The 3-Timer is water resistant to 300 meters (1000 ft) and has a screw down crown mechanism. The bi-directional bezel is very pleasant to use (not the rattle system as on the former Rolex Submariner and Omega Seamaster Professional models) and the used font for displaying the hours on the bezel has been designed by Linde Werdelin as well. Price of this green 3-Timer is 4920 Euro. Since it is restricted to 22 pieces world wide, I guess it will run out pretty fast.